A view of the global ocean circulation shows currents swirling around the hills and valleys in the sea surface. Currents flow around hills in a clockwise direction in the Northern Hemisphere, and in an anticlockwise direction around valleys (the opposite occurs in the Southern Hemisphere). These currents form loops on either side of the Equator. 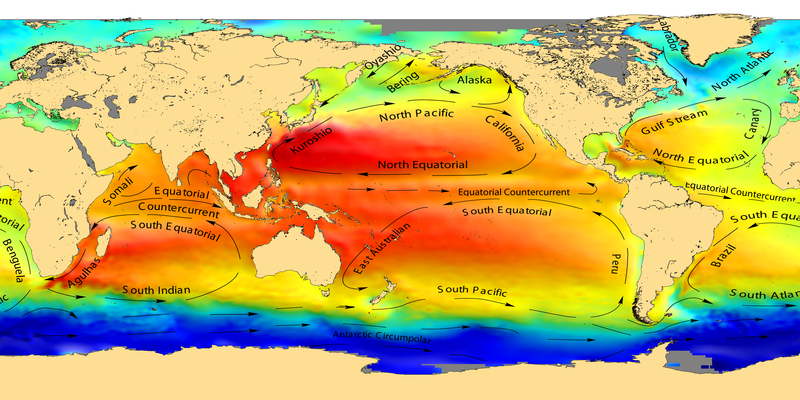 Sea surface heights also vary across the oceans: the largest difference and height between the Pacific and the Atlantic is due to variations in salinity.